This article was a product of meeting with some really cool disease ecologists at the Ocean Science Meeting 2016. It was picked up by IFLScience, Science Rocks My World and the Portland Press Herald amongst other outlets. "Team lobster! Dissemination of lobster research at the National Lobster Hatchery"
"Is there a down-side to MPAs? 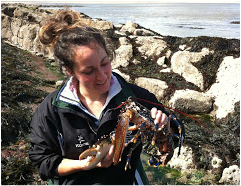 Understanding their impacts on population health and disease"
Swansea University student takes lobster research across the pond. My report for the Society of Biology after receiving a travel grant. This report was also published in its magazine The Biologist. Health survey of Lundy Island crustaceans - Integration of scientists and fishermen. SCIENTISTS from Swansea University are appealing to fishermen for information on crab and lobster shell disease and the locations of American Lobster. I was asked to guest-blog for the Society of Biology, following my research trip the the USA and Canada. A blog I maintain, trying to keep my science accessible to the public. The blog can also be viewed embedded on my website here. Footage of my research taken in both the laboratory and aboard Swansea University's research vessel the RV Noctiluca was used in a Welsh Government video 'Science for Wales'. A short video, just for fun, in which I document the (very sad!) day I released one of my control lobsters at Oxwich Bay, Gower. This lobster was originally from the same location and we wanted to give it the best chance of life in it's retirement. An advertisement video made for Swansea University, which won Gold at the Council for Advancement and Support of Education (CASE) Circle of Excellence Awards. The video was judged in America and a panel of experts selected our entry (short video category) from among 48 entries from across the world.